The holidays are here and I’ve got just the recipe you need for your festivities! 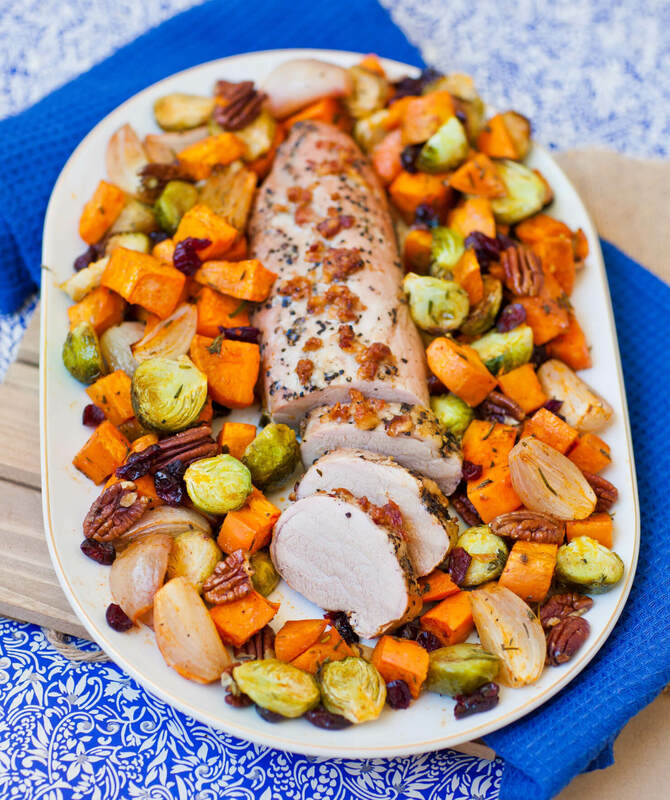 My ‘Hardwood Smoked Bacon Pork & Seasonal Veggie Medley’ is a delicious option for your next dinner party. 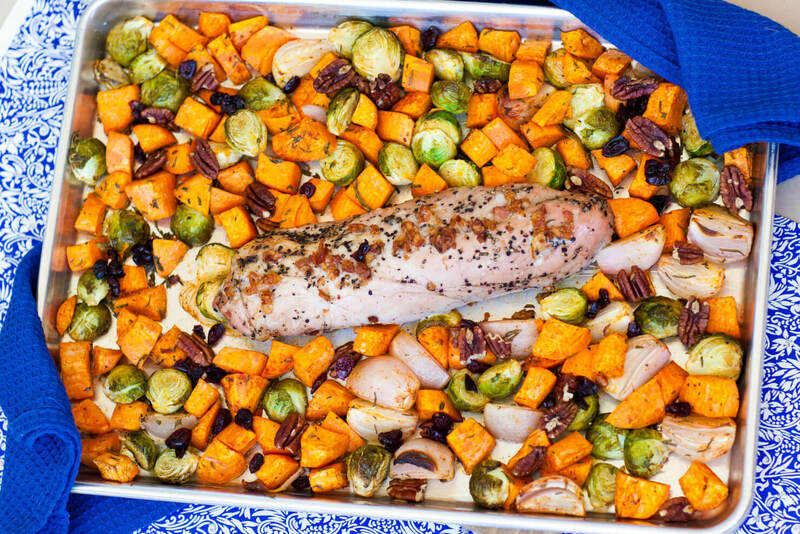 It’s an easy, one-pan recipe with sweet potatoes, brussels sprouts, pecans and sweet, dried cranberries. Just add Smithfield’s Marinated Fresh Pork Tenderloin in Hardwood Smoked Bacon & Cracked Black Pepper. 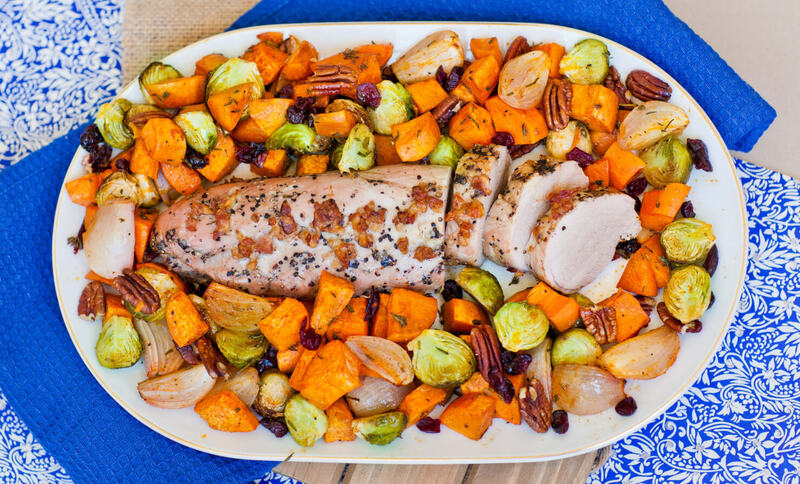 Everything is over-roasted in one pan so you have more time to enjoy the party! The pork tenderloin is juicy, flavorful and perfectly seasoned, so all the hard work is already done for you! If you’re in a pinch for time, portion the pork tenderloin into smaller pieces for even faster baking. 2. Prepare the vegetables. Peel and cube the sweet potatoes. Clean and cut in half the brussels sprouts. Clean and cut into quarters the shallots. Transfer the vegetables onto a large baking sheet. Add the pecan halves, dried cranberries, fresh herbs and seasonings and drizzle generously with olive oil. Using your hands or two spatulas, toss everything together until veggies are well coated and seasoned. 3. Remove the Smithfield pork tenderloin from its packaging. 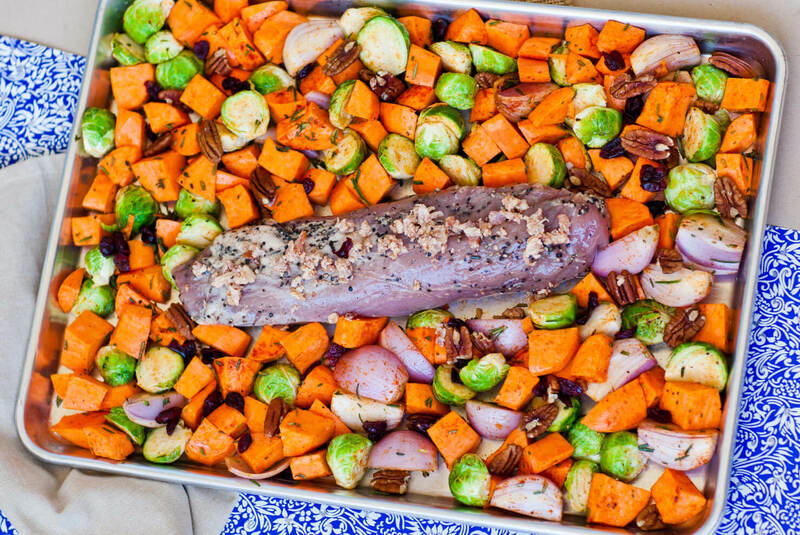 Place the tenderloin in the center of the baking sheet, arranging the veggies around it. Arrange the bacon bits along the top of the tenderloin. 4. Cover the baking pan with foil and bake covered for 15 minutes. Then remove foil and continue baking until pork reaches 150F and veggies are baked. 5. Allow the pork tenderloin to rest for 10 minutes before slicing into medallions for serving. Loved this recipe? Save it to your recipe board!